Pastural landscapes and short city trips. A diverse journey by train as inspiration for renovation and redecoration of NS office. The NS commissioned Inbo to design the interior of the office above the 's-Hertogenbosch station where the NS drivers and operators have a station point. The office is not large, but it is used intensively. Every day, around 250 NS staff members start and end their workday here and enjoy breaks in the break room. There is also an office housing 12 employees. In their design concept for the NS station point and supporting back office, architect Joop Tobben and his team found their inspiration in the “Journey of a station point employee”. They travel across the Dutch pastural landscape and dynamic urban environment, but they also have their moments to relax at the station points where they can rest and meet colleagues. Joop translated this journey into spaces of various scales. Most walls inside the area were removed; only the necessary ones now remain. By designing zones for calm (focus, calls, meetings), low noise (open working environment) and noise (general meeting space, dressing room), the nuisance for one another has been minimised. The proper materials in the right environment contribute to this aspect. There are many plants that improve the pleasance of both atmosphere and climate (humidity). 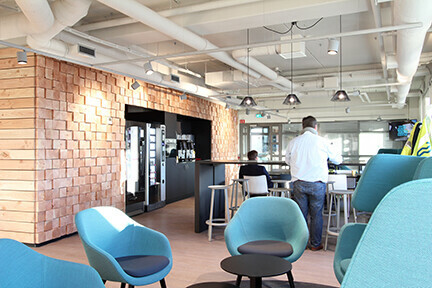 The break room of the office personnel is also the space where drivers and operators meet. Spontaneous meetings create the opportunity for the stories from outside (both good and bad) to naturally reach the ears of the supporting staff at the office. This helps in maintaining a connection. The choice to deviate from NS’ public corporate identity was made consciously. NS expressions were included in the interior, but not the colours used on trains or at the stations. The users hung historical photographs of the station and the people who worked there, thus helping create their own domestic feeling. The design, renovation and redecoration were a Design and Build assignment, which Inbo executed together with the main contractor Van Asperdt from Eindhoven. It was finished in early 2019.